Editor's Note: Education Overtime is an seven-week series that focuses on the conversations surrounding education issues that affect students, teachers, parents and the community. Cobb County, Georgia (CNN) -- For many, summer means vacation, sports, camping or just time off to relax, but not for millions of kids living in poverty in the United States. There are few camps or beach trips for them, and sometimes not even three meals a day. During the school year, public schools provide breakfast and lunch to millions of students in the United States. But when summer arrives, parents struggling to feed their children can no longer rely on those meals. More than 21 million children receive free or reduced-price lunches at school. But in the summer, the number of kids participating in food programs drops to fewer than 3 million, despite efforts to raise awareness and increase community support, the U.S. Department of Agriculture said. To help fill that gap, one community in suburban Atlanta is delivering food -- and hope -- in brown paper bags. Must Ministries is an organization in Cobb County, near Atlanta, that provides food, clothing and assistance to families in need. During the summer, volunteers pack hundreds of bag lunches for some of the nearly 46,000 kids in the county who qualify for free or reduced-priced meals during the school year. When she started as a volunteer 11 years ago, Must Ministries coordinator Paula Rigsby said they made 200 lunches every Friday. Now, they prepare up to 700 every day, and many parents rely on the help. "During the school year, they do not have to worry about feeding their children during the day," Rigsby said. "Feeding your own children in the summer time can be a hardship." Stephanie Bautista, mother of four, is grateful for the help. Without free lunches for her kids, she said, "I would have to go find something for them, or sacrifice something that I would want ... for my kids to eat. So it does help tremendously." The people who Rigsby serves have been hurt by the tough economy. "The way jobs are right now, it's too low," said Carla Rojas, mother of three. "Sometimes my husband works, but sometimes he doesn't. 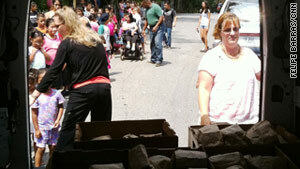 This help allows us to save money by getting food for our children." Rigsby has noticed a change as well. "We see a lot more fathers present that we have never seen before," she said. "Usually the fathers never come; it's the mothers that we see. Now the mothers have gone to work, either to baby-sit or clean, and it's the fathers walking to the children in the stop." Such hardships are felt not just in this Atlanta suburb, but nationwide. The number of kids who qualify for free or reduced-price meals is growing; it's up nearly 6% in the past three years. Families of four with an annual household income less than $28,000 are eligible for the school lunch program. Eatocracy: Kids too hungry to learn? In January, the U.S. Department of Agriculture proposed new rules to strengthen school breakfast and lunch nutrition standards. It would be the first change to school lunch standards in 15 years and would be part of the Obama administration's attempt to curb childhood obesity. The rules would increase the availability of fruits, vegetables, whole grains and low-fat milk while cutting the amount of sodium and saturated fat. It would reduce the availability of traditional school lunch staples such as pizza and french fries. Advocates say adequate nutrition can lead children to better lifelong eating habits and improved behavior and focus in school. But improvements during the school years don't help families during the summer. 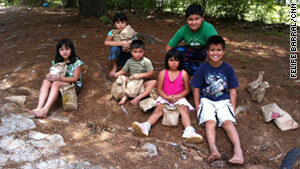 According to the National Poverty Center, children represent a disproportionate share of the poor in the United States. They are 25% of the total population, but 35% of the poor population. In 2008, more than 15 million children -- 1 in every 5 -- lived in poverty. "The lack of good nutrition is just one of the many issues children in poverty have to deal with," said Eric Jensen, author of "Teaching With Poverty in Mind." "These kids move around a lot, don't have much adult supervision or routine in their lives, and sometimes suffer from mistreatment or abuse. So it's no wonder studies have shown that low-income students tend to be low performers in school." So while providing food is a good start, it's not the only thing these kids need. "Hope is the main tool, giving our kids a sense of hope, and belief that they can do it," said Christa Flood, a school administrator from Charlotte, North Carolina. "Once you transform their minds, they act in a different manner." Ultimately, it's important to feed kids' minds and bodies, educators said. Jensen said efforts like the summer lunch program help reduce children's stress levels, which is critical in helping them learn. That's why on any given summer day, you can find Paula Rigsby and her fellow volunteers trying to give local kids a boost -- one lunch at a time.